In a blink of an eye, the happy chaos of your wedding day is over, and you and your husband are the only ones that linger. What next? The honeymoon, of course. Take the chance to journey off the beaten path and into paradises you’ve never seen, much less imagined. Forget the atypical hotels and trendy beaches that half-hearted Pinterest boards offer you. Adventurous spirits need the extraordinary, and our list of phenomenal destinations will get your heart racing. Fitted into the otherworldly landscape of Southern Utah, the raw beauty of nature is arresting on sight. Weather beaten warm rocks hide the resort from prying eyes, designed to be a monastery of luxury. It’s a retreat in every sense of the word- with perfection planned into its amenities and architecture, crafted for the comfort of those seeking contemplation and meditation. To be with your significant other here in this breathtaking landscape is a whole new experience in itself, and don’t be too worried about flocks of tourists there. Amangiri ensures that with only 34 suites, you can fill up your time enjoying the landscape around you in the comforts of the resort, hike through the meandering rock formations with an expert guide, or simply relax in their Barragan-inspired spahouse- all at your own leisure. 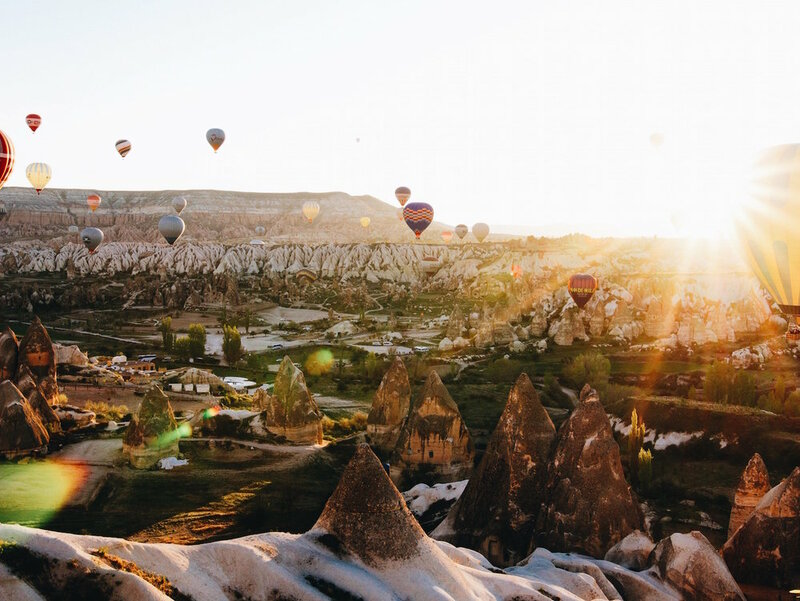 You must have seen an iconic scene of hot air balloons of a hundred different colours all rising up through filmy dawn skies at least once before, on social media, television, or even paintings. This whimsical wonderland is so much more than that, housing secret underground caverns both natural and carved by man through the ages, and exotic bazaars filled to the brim with the hustle and bustle of merchants and hagglers alike. It’s a geological oddity that translates into a curious lunar-like view of the land, with towering boulders that dip down in soft curves, carved by millions of years of erosion. Explore every nook and cranny this mysterious land has to offer with your beloved; it offers rich foods and an even richer heritage, if you would only lend your ear. If the tropics are your thing and you’re looking to escape to somewhere that’s warm and lush with the greenery that only rainforests can provide, look no further. Ananda in the Himalayas of India is a wellness retreat located on a sprawling Maharaja’s (King’s) estate, designed with 78 rooms in the British colonial style. Lounge in soft, leaf-filtered sunlight while indulging in an array of organic and locally grown fare, or go on a safari in the nearby Rajaji National Park. You can also trek through the trails leading into the forest or settle down for a holistic healing of mind, body, and soul with your partner. What better way than to start a new relationship upon a clean slate?